We’re forever on the hunt for anything fresh and exciting coming to the wedding industry and this season, Ever After Dartmoor have nailed some truly awesome pop up ideas at their venue in Devon. This year they are offering exclusively to their booked couples the opportunity to have their very own pop up lounges for the evening. Fancy some civilised post dinner whiskey and cigars in their art deco inspired club lounge? Or why not sample some artisan gin or bubbly in their opulent lounge, kitted out with old style Hollywood glamour? 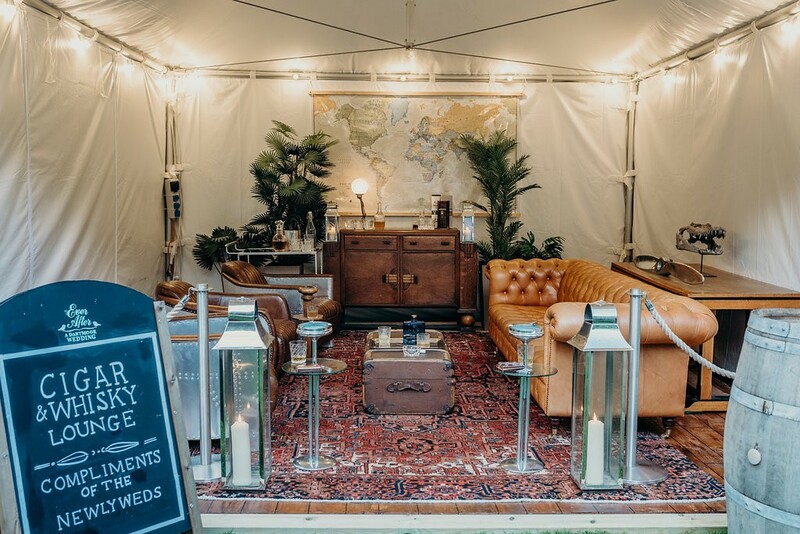 The creative team at Ever After Dartmoor have their fingers on the pulse when it comes to countryside luxe - you only need to take a look at the rest of the gorgeous venue to work that out – so read on to find out all you need to know about these fabulous pop ups. The lounge comes with it’s own 4.5m squared white canopy with roll down sides in case it gets chilly. If the weather is dry, the lounges will be popped on the lawn whilst the guests are having their wedding breakfast. If the weather is wet, they will pop up the loungers within the marquee during the change over period after your wedding breakfast. The whiskey and cigar lounge comes set with a 4 seater vintage leather chesterfield sofa, 3 art deco leather and aluminium club chairs, art deco cocktail cabinet and persian rug along with décor items including vintage steamer trunks, floor standing ashtrays, whisky decanters and glasses. They include 3 glasses and 3 different types of whiskey. The cigars are an optional extra from Guantleys, suppliers of cigars, pipes and tobacco since 1880. The bubbles and botanicals lounge includes elegant white leather sofas, white leather cubes, silver mock croc cocktail cabinet, chrome and glass coffee table, champagne art deco lamps and décor items including drinks stands, trays and ice baths. Indulge in a gorgeous old style coupe of champagne for the Hollywood experience or a balloon glass of hand-crafted botanical gin. They will supply champagne and artisan gin with Fever Tree tonic, cucumber, limes and ice. To find out more about hosting your wedding at Ever After Dartmoor and getting your hands on one or both of these pop ups for your day, enquire with the team here.